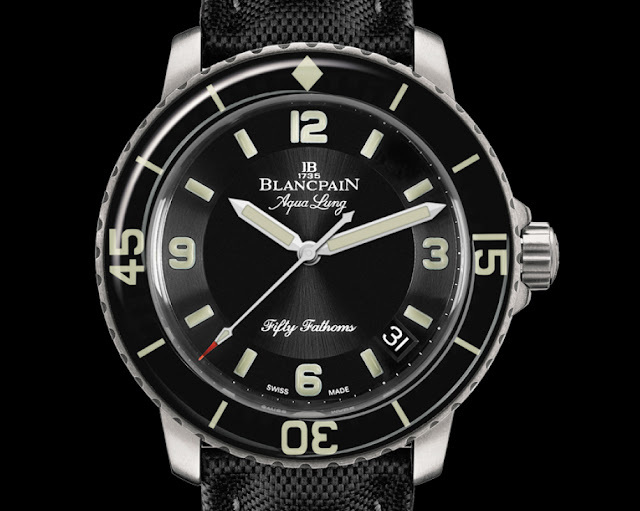 Blancpain created the first Fifty Fathoms model, a diving watch for the frogmen of the French army, in 1953. Worn by Jacques Cousteau himself, this timepiece took on iconic status. 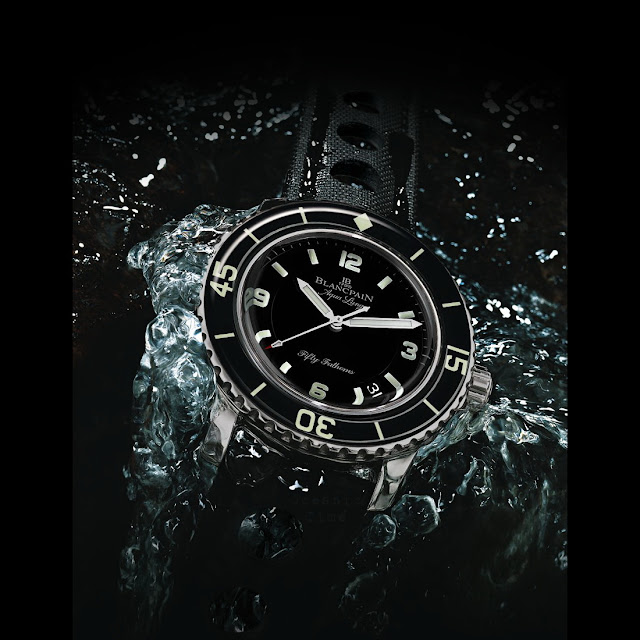 Today, Blancpain produces it as a family of watches water-resistant to a depth of as much as 1,000 m.
Robust and contemporary, the Fifty Fathoms models display sporty looks and vigorously masculine design with a unidirectional rotating bezel covered by sapphire. The figures and hands, visible in the dark, are set off by a dial that is usually dark in color. The self-winding Blancpain “Tribute to Fifty Fathoms Aqua Lung” is a special edition, limited to 500 pieces, coming with a slightly different dial characterized by the text 'Aqua Lung' as its predecessors of the 1950s did. Compared to other watches of the Fifty Fathoms line, this tribute model features a simplified bezel without the minute markers between 0 and 15. The strap has circular holes, the way many original Aqua Lung's straps were typically designed. Case diameter is 45 mm. Blancpain created the first Fifty Fathoms model, a diving watch for the frogmen of the French army, in 1953. 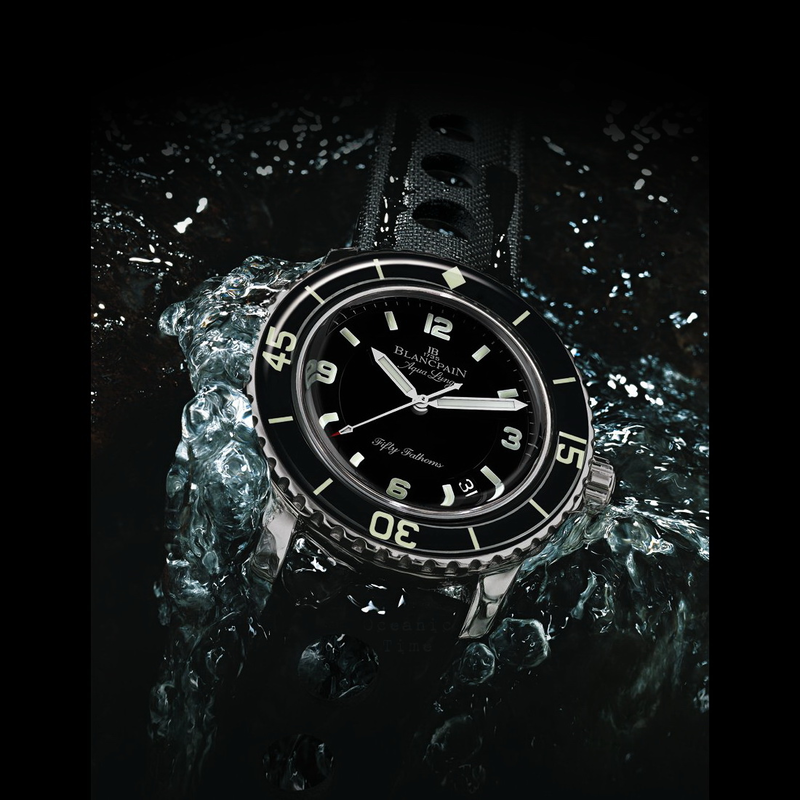 The self-winding Blancpain “Tribute to Fifty Fathoms Aqua Lung” is a special edition, limited to 500 pieces, coming with a slightly different dial characterized by the text 'Aqua Lung' as its predecessors of the 1950s did.